There’s no doubt about it, Eric Clapton is possibly one of the most influential guitarists of all time and while he tends to get overlooked these days in favor of the the more technical players, there’s a lot you can learn from the great man. 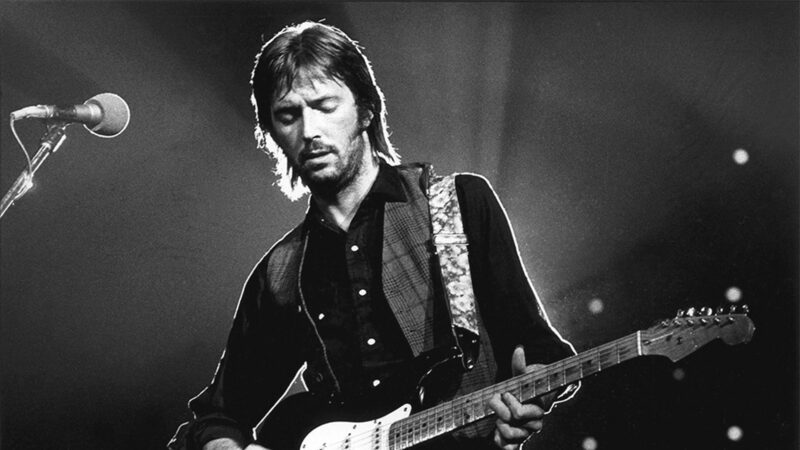 Clapton will always be a huge influence on my playing and his flowing pentatonic lines are an endless source of inspiration for licks and runs using predominantly the minor pentatonic scale. In this lesson, we’ll look at a couple of ways in which Eric creates those seamless spurts of creativity when soloing. You’ve probably noticed that when he takes a solo, Eric’s hand remains firmly clamped in and around box 1 of the minor pentatonic scale. The amount of mileage he can get out of this tiny fragment of the fretboard is quite something but when he ventures up the dusty end, he takes a more horizontal approach to things. In terms of patterns (though I’m sure he doesn’t think this way), it’s almost as if he chops the pentatonic scale in half and uses the top three or four strings to navigate to the higher (and lower) reaches of the fretboard. Let’s take a look at how these patterns connect to see a logical (since most soloing is done on the top four strings anyway) alternative to awkwardly trying mesh together the famous five pentatonic patterns. We’ll do this in D Minor so you can go and rip over ‘White Room’ with it. You probably already move up to the above pentatonic fragment quite naturally but what about the next one? First of all, start from box 1 and work your way the fretboard until you run out of space. You don’t have to play any licks here as our focus is to be able to find the notes without thinking. When you come back down the fretboard go past box 1 and see if you can work out the patterns all the way to the nut. There are no new patterns, you just have to work out which one comes next in the sequence. Next, try working with each individual pattern while expanding your vision to the adjacent ones. Take note of where the root notes are, as well as the notes you can slide or bend up to in the adjacent patterns. For example, you can bend the D on the B string up 3 semi-tones (3 frets), and likewise with the A on the G string, but the G on the top E string can only be bent up 2 semi-tones (2 frets). Practice anchoring either your first or third finger on the root note in each pattern, as does Clapton, and see what you can come up with. This is a great way to practice phrasing as you have a finger clamped on the root note to resolve all your licks and runs. The pentatonic scale lends itself well to the expressive techniques in guitar playing such as bends, slides, hammer-ons, pull-offs, vibrato etc., and you’ll see Eric really take advantage of this in every one of his solos. Eric isn’t known for his fast picking technique or shredding ability–and for good reason–he squeezes every drop of emotion out of the pentatonic scale using bends at varying speeds, his amazing vibrato and flurries of hammer-ons and pull-offs. What you could do next is add in the blue note (b5) to each pattern, as well as the major 3rd to take things in a more bluesy direction. To do this, practice bending the b3 up a semi-tone and playing the chromatic note in between the 4 and the 5. If you like the idea of horizontal movement on the fretboard, check out our free eBook: Horizontal Soloing System.